The MMA focuses on the following commodity markets and their ETFs in order to pinpoint the start of the monster moves I’m expecting. 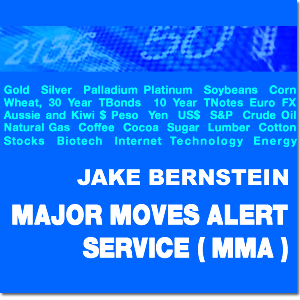 Gold, Silver, Palladium, Platinum, Soybeans, Corn, Wheat, 30 Year TBonds, 10 Year TNotes, Euro FX, Aussie and Kiwi $, Peso, Yen, US$, S&P, Crude Oil, Natural Gas, Coffee, Cocoa, Sugar, Lumber, Cotton and 2 major stocks in each of 15 stock sectors (i.e., energy, biotech, technology, internet etc). Here’s the focus MMA will give you: The MMA focuses on the following commodity markets and their ETFs in order to pinpoint the start of the monster moves I’m expecting. CHARTS and LOGIC for each recommended trade will be included on: Gold, Silver, Palladium, Platinum, Soybeans, Corn, Wheat, 30 Year TBonds, 10 Year TNotes, Euro FX, Aussie and Kiwi $, Peso, Yen, US$, S&P, Crude Oil, Natural Gas, Coffee, Cocoa, Sugar, Lumber, Cotton and 2 major stocks in each of 15 stock sectors (i.e., energy, biotech, technology, internet etc). Also included : buy and sell hedge advice for grain and livestock producers as well as my view on REAL ESTATE.